With the Skrull invasion at its climax, both New Avengers and Mighty Avengers had ceased their ongoing narrative to focus on the events that led so many of their friends and partners to be replaced by the shape-shifters. This month, our attention returns to the present. 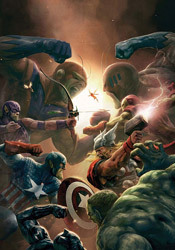 Picking up where Secret Invasion #2 left off, both squads of Avengers have faced off against… themselves. When a Skrull ship crash-landed in the Savage Land, members of both teams expected a confrontation with the real enemy. But when mirror images of themselves emerged from the ship, wearing wardrobe from twenty years prior and proclaiming themselves liberated from a long captivity in outer space, nobody was quite sure how to react. I guess that means it's time for a brawl! With just about every other member's stories fully explored, we've finally come back to what has to be the most compelling confrontation of the conflict: the Skrull Captain America vs. Spider-Man, Ka-Zar and half of the Savage Land's resident population. Writer Brian Michael Bendis presents this as an appropriate conflict of interests for the “real” heroes, playing up Spidey's emotional attachment to Cap and emphasizing just how hard it must be to throw down with the man he'd just buried, mourned and left behind. Spider-Man provides the readers' perspective in this issue. His reluctance to commit wholeheartedly to the fight is understandable: he wants to believe more than anything that this is the real Steve Rogers, that the one who was murdered in the wake of Civil War was the imposter, but deep down inside he knows that the chances of that fall somewhere between slim and none. Around its midway point, the story changes gears to cover even more of the imposter Skrulls' backstage planning sessions. It's at that point that the issue takes a turn for the worse, from which it never recovers. As a reader of both regular Avengers books and the primary Secret Invasion mini-series, I've already seen enough back-story. I understand that the aliens drape some sort of mystical cloth over their heads and suddenly believe without hesitation that they're human, specifically a member of the superhero community. I must've seen it half a dozen times already, but Bendis insists we trudge through it yet again right here. It's something that I don't think the issue needed, but it's there all the same, and it eats up the majority of the issue. Which is a shame, because it started off on such a strong foot. I didn't particularly care for Billy Tan's artwork this issue. While much of his work this month is focused on an emotional, explosive conflict, his artwork never reflected the excitement of those moments. It felt like he was merely documenting the moment, not collaborating with the writing to take the whole package to the next level. When the foreign Cap flings Ka-Zar over his shoulder and into a crowd, Tan treats it so nonchalantly that it nearly lost my attention. Where I'm prone to enjoying a good action page much longer than I should, enjoying the intricacies of each pose, freeze frame and moment of impact, Tan's work led me to have precisely the opposite reaction. I rushed to the end of the fight scene, which left me feeling somewhat robbed. If this is Marvel's premiere book, they need to routinely feature premiere talent. And, despite a good page or two here and there, Tan just isn't on the right level for this kind of work. This month's New Avengers provides little more than a footnote in the big picture of the Skrull invasion. It answers your questions about the Captain America that crash-landed in the jungle during Secret Invasion #2, but that turns out to be short on substance and the rest of the issue offers little else. Flip through this to get the jist of it, but stop short of bringing it home with you. It's not a high water point.